This was the year General Motors Co. and Nissan made good on their promise to bring mass-produced electric cars to the market. But don't count on seeing one in traffic soon. Sales so far have been microscopic and they're likely to stay that way for some time because of limited supplies. GM sold between 250 and 350 Chevy Volts this month and Nissan's sales totaled less than 10 Leaf sedans in the past two weeks. Production for both is slowly ramping up. The first electric car sales were marked with fanfare. The envy of green-car geeks across the country, new owners were treated like rock stars at dealerships. They were greeted by high-level GM and Nissan executives, followed by cameramen and interviewed by local reporters. When they got home, they blogged about their experiences, sent links of newspaper stories to their friends, and stopped to talk to anyone who expressed interest in their new wheels. Jeff Heeren of Nashville, Tenn., became the sixth Nissan Leaf owner on Dec. 22. Nissan's advertising agency, Chiat Day, followed Heeren and his family around as they picked up their silver-colored Leaf, and have posted a video on the Leaf's Facebook page. Not surprisingly, Heeren is a fan. "What's amazed me the most in driving it is that it's just a car, like any other car," he said. The Leaf is the only all-electric car on the market. It can travel about 100 miles on battery power before needing to be recharged. Using a standard outlet, that takes 16 to 18 hours. Nissan Motor Co. recommends that Leaf owners install a 220/240-volt outlet in their homes so they can recharge in about seven hours. Japan-based Nissan initially sent only 10 Leafs to the U.S. and spokesman David Reuter said a second shipment of around 90 cars that arrived by cargo ship on Dec. 23 is on the way to dealers. Nissan won't give estimates on how many Leaf sedans it expects to sell in the U.S. next year, but says it has capacity to make 50,000 annually at a plant in Oppama, Japan. Those will be sold in Japan, the U.S. and Europe. The Volt goes about 40 miles on battery power alone before needing to be recharged. But it comes with a backup gas engine that GM says can extend its range to 375 miles as it kicks in to recharge the batteries on the fly. The Volts are being assembled in Detroit. GM predicts it will sell 10,000 of them in 2011 and between 35,000 and 45,000 in 2012. By way of comparison, Chevrolet sold 187,250 Malibu sedans in the first 11 months of the year with sticker prices that start at $21,975. Hybrids made up 2.4 percent of U.S. sales this year and the category that includes hybrids and electric cars is expected to double to 4.8 percent by 2013, according to consumer web site Edmunds.com. But electric vehicles likely will be only a small part of this total, said Michelle Krebs, senior analyst at Edmunds, and she doubts they will be big money makers for the car companies. Rumors that GM may end on Jan. 3 the $350-a-month lease promotion it began advertising this summer sent some Volt buyers scrambling to close early. Peter Schleck, an attorney in Rockville, Md., knows his Volt is heading towards Maryland on a freight train. But he's already signed the papers making him its official owner. GM spokesman Rob Peterson says the Volt lease terms "will extend into 2011, but I don't have the specifics on how long it will be out there." He added that the company expects to honor the deal for people who have already put down a deposit. Paul and Cari Sykes of Fort Worth, Texas, made a $1,000 deposit on a Volt earlier this month, expecting to pay $350 a month for a lease. They know their car is on its way — theirs was the 724th built — and they are both excited and worried that they may have acted a bit irrationally. They've never purchased a car at sticker price before, nor have they bought a car sight unseen. They've never driven the Volt. The closest they came was when the buyer of the first Volt in Granbury, Texas, let them join him in a test drive. As passengers. "I've never done anything like this before," Cari Sykes said. "I hope I can say three years from now that I was part of the transformation, and will be ready to buy the next generation." Felix Kramer is doing his part to boost electric car sales. The Redwood City, Calif., resident picked up his white Chevy Volt last week, and he is on the waiting list for a Nissan Leaf. Kramer is the founder of CalCars.org, a group promoting development of cars that get 100 mpg or more. He said his family put 350 miles on the odometer in the first week and used only 2.4 gallons of gas. He's averaging about 35 miles on electric power per charge, right in the middle of the 25 miles to 50 miles he was expecting. His son Josh, 20, was driving the Volt around town and was followed home off the freeway by a state trooper. Rather than giving him a ticket, the trooper peppered him with questions about the car. Kramer said he's impressed by how quickly the Volt accelerates from a stop or on the highway. His only complaint: the loud beeping noise when the car is in reverse. "I'm going to find out if there's some way to change that," he said. I am an electric vehicle enthusiast. I support electric vehicles and have my own company set up to build a city EV, but 50,000 "orders" for Volts is a lot different than 50,000 "inquires" about Volts. Other than early adopters who will pay a lot for something as unique and special as a Volt is a lot different than the more average car owner. 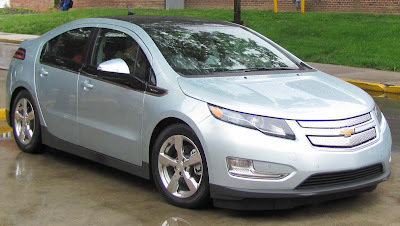 At $40,000 (less the $7,500 tax rebate that we the taxpayers are paying for) the Volt does not make economic sense. I am not sure there are even 10,000 early adoptors. I do think the GM's of the World are already lobbying in Congress the get the tax credit doubled before sales fall off. Obama wants this, I want EV's to happen, but you can't use our money to buy it. You have got to remember that Obama has totally stacked the Board of Directors (and CEO) at GM with his appointees and their mission is no further than "get the taxpayers money back." This is too bad for GM and its long term survival.